During my genealogy research I’ve visited many cemeteries along the way and have taken pictures of at least one hundred headstones. While I am looking for lost family members or volunteering to do it for someone else, I sometimes take photos of the cemetery itself. I’ve always found cemeteries both fascinating and calming. They’re like a park full of local history and some of them were originally built that way. There is a certain beauty to the melding of the stones and nature, especially if you visit during certain times of the year like fall or spring. 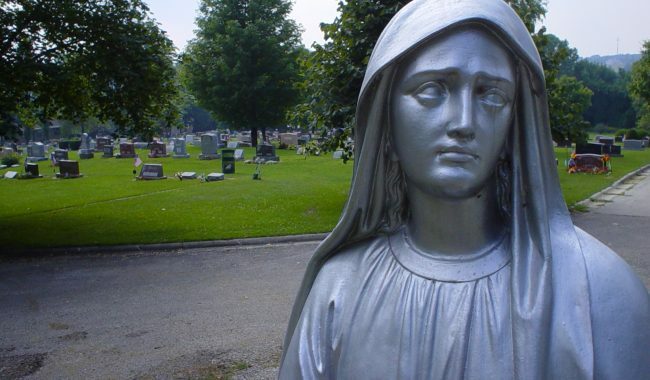 Here are ten of the favorite cemetery photos that I have taken over the years. 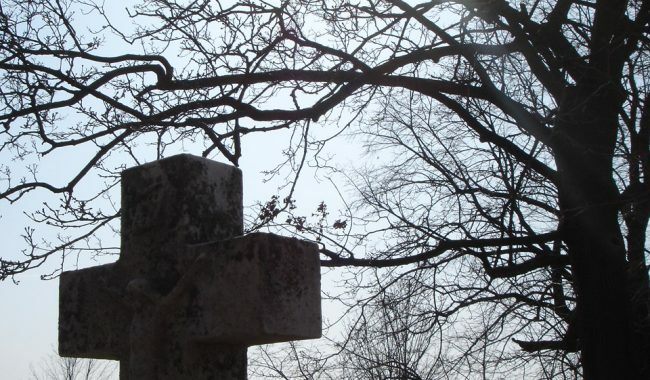 St. Francis Borgia Cemetery, Cedarburg, Ozaukee, Wisconsin - taken at the beginning of spring before nature woke up. 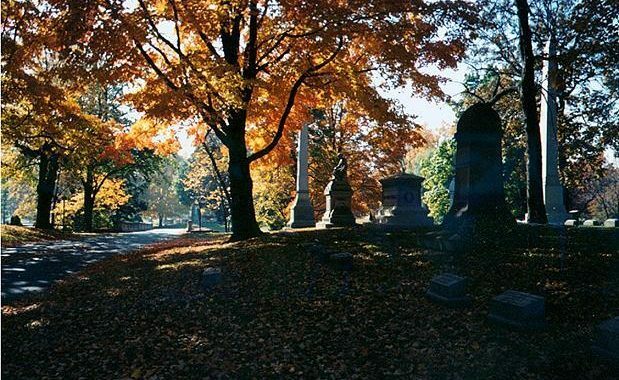 Forest Home Cemetery, Milwaukee, Wisconsin - one of my favorite cemeteries and one of the most beautiful especially in the fall. 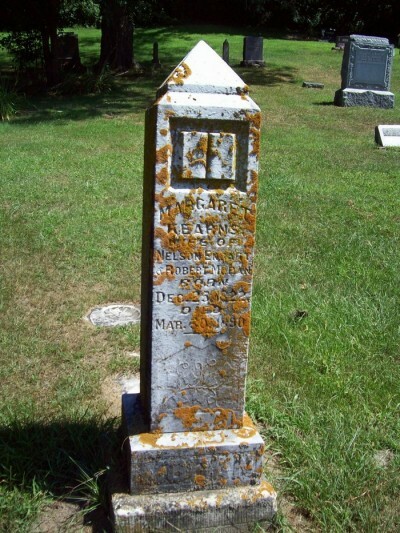 The headstone of my wife’s 3rd-great-grandmother Margaret KEARNS from her father’s maternal side. Born in 1822 in Ohio, she first married Nelson ENYART (sometimes spelled ENGART) in 1841. There is mystery surrounding what happened to Nelson, but in 1875 she ended up marrying Robert MORAN, who is actually my wife’s 3rd-great-grandfather from her father’s paternal side. They didn’t have any children, so the branch of that tree didn’t get too twisted. 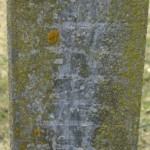 She died in 1890 and is buried near Robert at Tavara Cemetery in Richwood Township in Richland Co., Wisconsin. Photo courtesy of B. Coberley at Find-A-Grave. 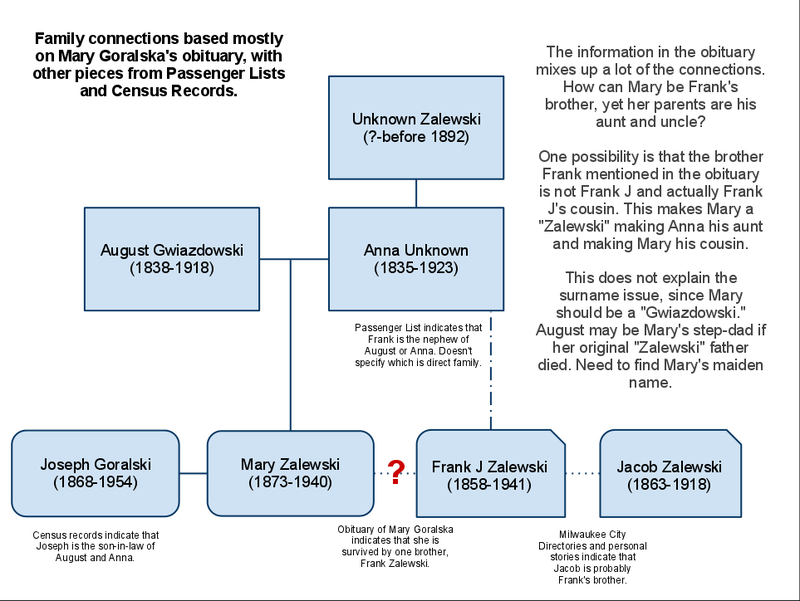 Anyone following the latest research into my ZALEWSKI line knows that I’ve run across the GWIAZDOWSKI surname on a few occasions. They have something to do with my ZALEWSKI family, but I’m still not 100% sure what it is. Research points to many conflicting options: These are Frank ZALEWSKI’s parents, these are Frank’s aunt and uncle, or maybe they’re just good friends. I have more research to do with the Polish/German church records I recently found at the FHL. 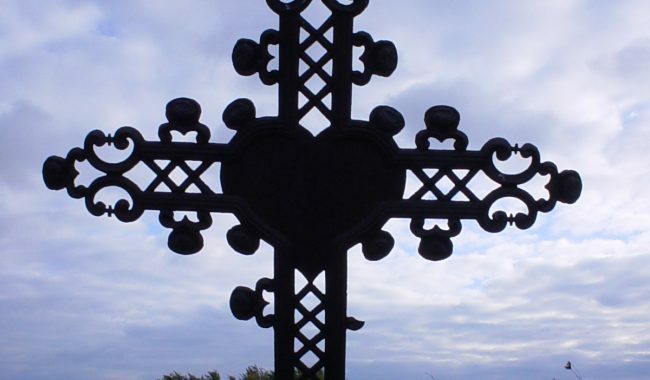 Today I received another great email that two more of my ancestor’s headstones were found and photographed by a friendly Find-A-Grave volunteer. I don’t remember when I requested these, but it’s nice to finally know where they are located. Though, it’s interesting to see that their headstone spells their name Sterns, instead of Stearns. Click the thumbnails for larger versions. My 3rd-great-grandparents, Henry Stearns (also known as Georg Heinrich Stierns) and his wife Margaret (also known as Katherine Rosina Margaretha Schumacher), immigrated from Württemberg, Germany with their four children and settled in northern Wisconsin. 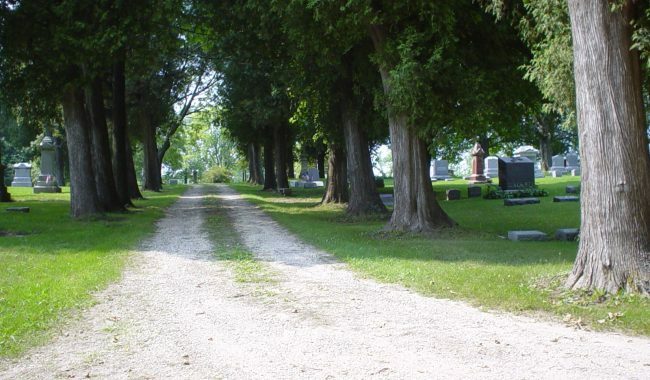 They are both now buried at Oakwood Cemetery in Weyauwega, Waupaca Co., Wisconsin. 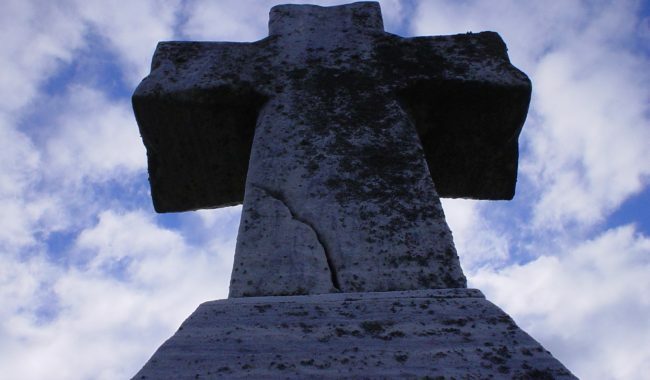 Links to their Find-A-Grave entries: Henry Stearns & Margaret Stearns. I probably didn’t pick the best day to do some more research at Holy Cross Cemetery in Milwaukee today. A wonderful “spring” day in Wisconsin, a windy 23 degrees with snow flurries. I also should have probably worn more than a sweatshirt, but it wasn’t all that bad. I did have a knit cap on. Last night I made a list of all of the headstones I wanted to find at the cemetery, including some I already had. I wanted to get better quality photos. Well, the small list turned into two pages of entries, about 55 total. Thanks to the Archdiocese website, I was able to map (the general area) of where the stones were. 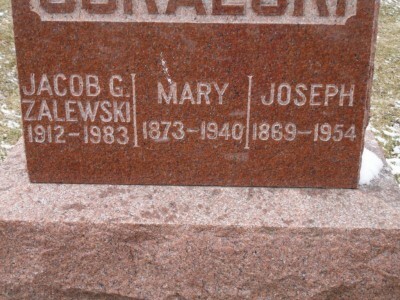 I hit up the stones I really wanted to find first, the Gwiazdowski, Goralski, and Jacob Zalewski family. 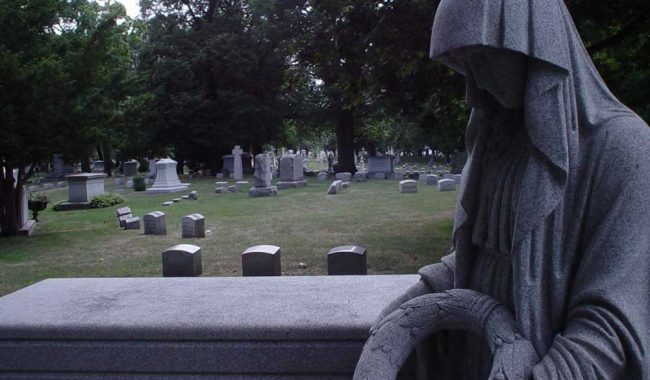 Once I found the section and started to walk the graves, I cursed myself for not wearing a larger coat. Though, once I found the collection of stones I forgot about the cold. All of the stones were in one area in the middle of Block 4B. I caught the “Goralski” name on one of the large stones while walking. 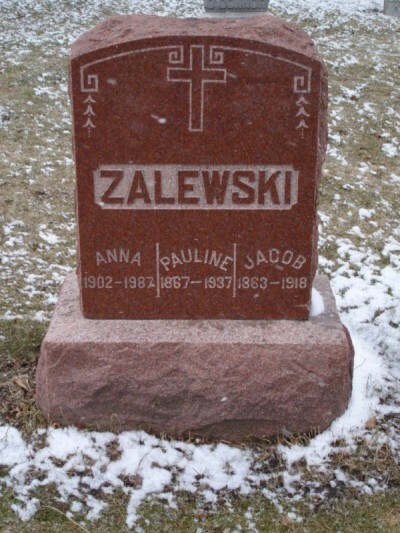 The way the graves were set up mostly solidifies the Gwiazdowski/Goralski/Zalewski connection, because Jacob Zalewski, Jr and his wife were on the same stone as the Goralski’s and Gwiazdowski’s. I know it’s not proof, but there are few reasons why else they would be on the same stone. 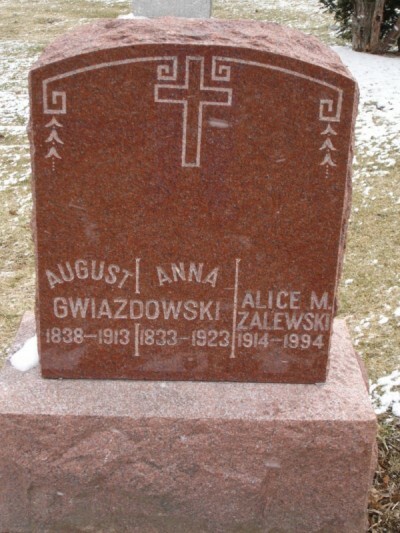 On the other side of this stone are August & Anna GWIAZDOWSKI and Jacob’s wife, Alice. That’s another notch in the connection that Mary is August & Anna’s daughter. Jacob, Sr & Pauline ZALEWSKI, along with their son Edward and his wife Kathryn were on the next headstone to the south. Unfortunately, there wasn’t much but dates on the stones. I was hoping maybe for maiden names or birth places. It’s still more proof and it’s nice to finally visit their final resting place. I didn’t get to my whole list since the other sections were mostly all flat headstones and I didn’t want to have to walk in the snow and cold to try to find them. Even though I had pinpointed it to Section, Lot, and Grave number, it was hard to figure out where the specific Lots were. I’ll come back later and get those photos once it’s actually spring here. My dad said he would also like to tag along, but he wasn’t feeling well today and it wasn’t a very pleasant day to go anyway. I made some great discoveries this weekend and late last night. I’m going to try to spell it all out here, so excuse me if I ramble a bit. While the information I found paints a better picture of the family of my ancestor, it also throws a wrench into the whole thing, but when doesn’t genealogy do that? 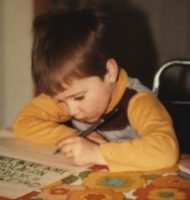 Let’s start from the beginning, though instead of writing it all out again, I will point you to an older post and one recent post. Though, you should just be able to skim over the newer one. Long story short, this has to do with the GWIAZDOWSKI – GORALSKI – ZALEWSKI connection I have been researching recently. That makes sense to me. Either August or Anna is Frank’s uncle or aunt, respectively. I can deal with that. It helps me a little bit. Fast forward to last night. 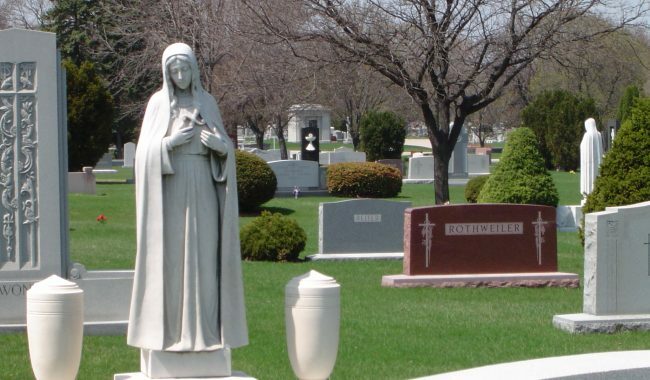 I “run across” the website for the Archdiocese of Milwaukee Catholic Cemeteries. I use quotes there because I’ve been to this site before, it’s been there for years. 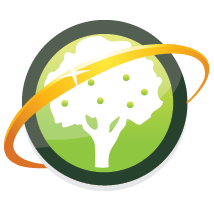 I just never knew they had such a wonderful genealogy/burial record search. 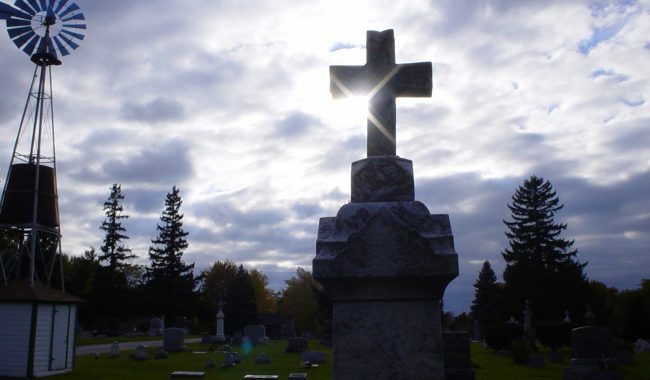 Not only does it have up-to-date burial records for eight prominent cemeteries in Milwaukee, it includes death date, burial date, last know address, marital status at death, and burial location. That’s not even the best part. It also includes a link to “Search for nearby graves or crypts.” With this feature, I can see which graves are nearby to this one. I was able to make (pretty confident) connections between people. More than likely people were buried near family. 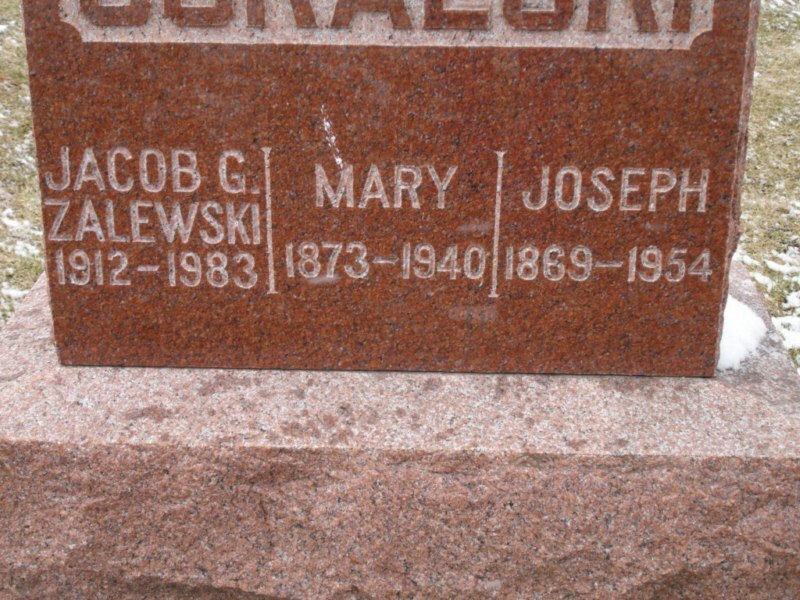 So, with this I not only found the death date of Jacob ZALEWSKI (on the figure above) that I’ve been trying to find, but I also found the burial information on a Mrs. Mary GORALSKA (as it’s listed on the site.) She is buried near her husband Joseph and Mr. and Mrs. August GWIAZDOWSKI. On a related note (har har), also buried in the same location is a Jacob George ZALEWSKI (the above Jacob’s son) and his wife Alice. Now that doesn’t prove that Jacob is related to them (which also includes Frank, his brother) but it gives hope. Now, this information is very helpful on it’s own, but when I use it along with the century of archives of The Milwaukee Journal, it gets even more powerful. Unfortunately, before about 1930 or so, they didn’t list much in the death notices. I found both August and Anna GWIAZDOWSKI, listed in the paper, but it’s just their name, address, death date, and cemetery. What I did find was Mary’s obituary from April 2, 1940. You see it, don’t you? “…also survived by 1 brother, Frank Zalewski…” I was elated at this point. 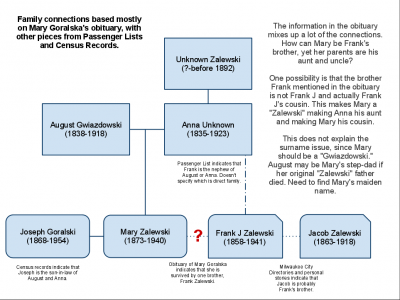 I thought to myself, “I found Frank’s parents!” Then, I started doing the math.. How can Mary be Frank’s brother if there is no way, under normal circumstances, that she would ever have the last name of ZALEWSKI? 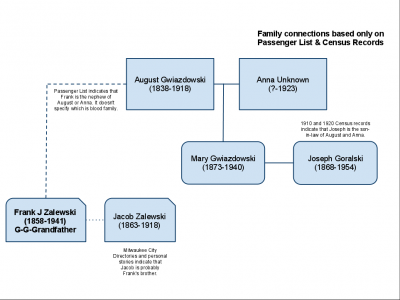 She was a GORALSKI when she was married and according to the other documents, her parent’s last name was GWIAZDOWSKI. How does that work? Then I thought, maybe it’s not my Frank Zalewski, but another Frank. So, Mary would be my Frank’s cousin. That makes sense logically and follows the info in the passenger list, but again doesn’t solve the name issue. Here, again I visualized it, which helped a bit. So, after all of that running through my head I decided the only outcome that made sense is that Mary is my Frank’s cousin (the brother is another Frank), which is safe with the “nephew” info from the passenger list. The only way I was able to solve the surname issue was assuming that Anna is Mary’s real mother and August is her step-dad. Maybe Anna’s first husband (Mary’s father) passed away and she re-married before travelling to the US. Now, this is only true if all of the information is correct, which is another possibility. 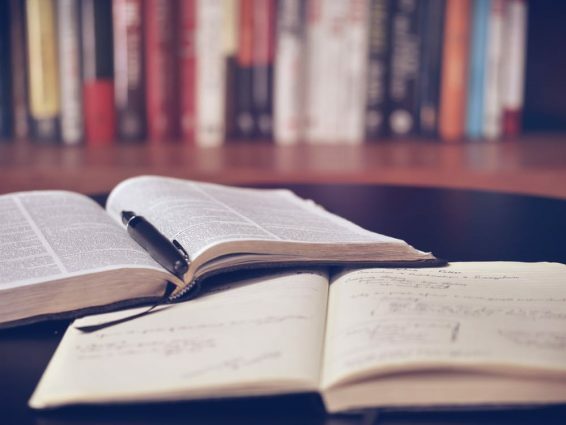 I’m still no further in my research, though I now have things I can do. Unfortunately, it seems Joseph & Mary had no children, so I probably need to order Mary’s death certificate from the Wisconsin Vital Records office to find her maiden name. Hopefully, she also lists her parent’s names on it. I should maybe even order Jacob’s or Anna’s. I’ll have $20 riding on that hope. Did that all make sense? Can you follow it and come up with another conclusion? 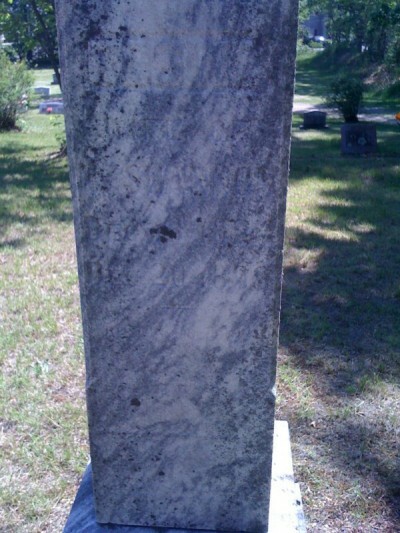 Tombstone Tuesday: Where Did He Go? 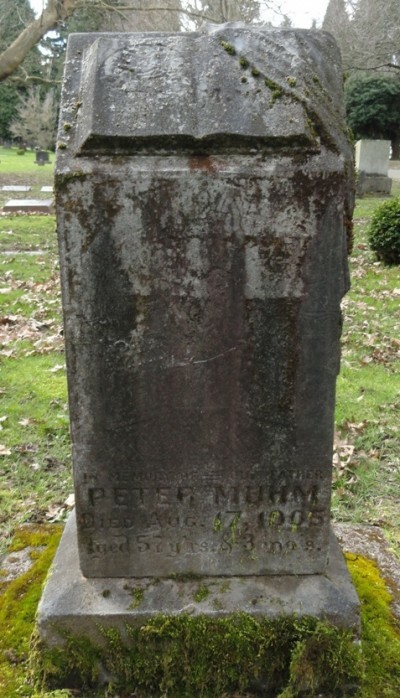 For years I had lost track of my 3rd-great-grandfather, Peter MUHM. He and his wife, Ida (SCHAVANDIE) MUHM, lived in Wisconsin for many years. I tracked Ida to Langlade County, Wisconsin in 1934 where she finally rests at Elmwood Cemetery in Antigo. Where was Peter? Good question. I also couldn’t find them in the 1900 Census records. For five years Mr. and Mrs. Muhm farmed with only a grub hoe, pitchfork, and hoe. Grain and hay were carried from the field to the barn on the pitchfork. Sometime after beginning their clearing, a cow and a few chickens were bought, and with other additions, little by little, they soon had a prosperous little farm. At the beginning fish, wild game, and deer afforded the only meat the family had. Mr. Muhm had shot 99 deer before he sold his farm in 1902 and went to Portland, Oregon. As a pioneer he built many of the first houses and barns in the county, and also made coffins for the dead. Three years after moving to Portland, Mr. Muhm died as the result of a fall he suffered when a scaffold collapsed. Mrs. Muhm continued to live there for sixteen years, then returned here to make her home with her daughters, Mrs. Joe Narlow, and Mrs. Fred Van Atter. Another daughter, Mrs. Peter Van Price lives in Port Washington; a son Edward in San Francisco, and an older son, George, in Portland, Oregon. Tada! There is the information I needed. Peter and his wife moved to Portland, Oregon (reasons still unknown) and he died after falling from a scaffold in 1905. I also had found an “Ida MUHM” in the 1910 Census in Oregon that now made sense. 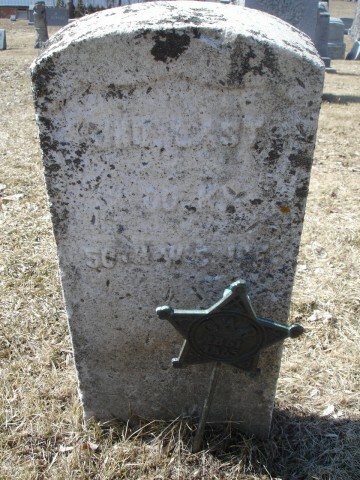 Then, on a whim, I ran “MUHM” through the Find-A-Grave search system in Oregon and what do you know, I found his headstone located in Lone Fir Pioneer Cemetery in Portland. A nice volunteer by the name of VDR had photographed it sometime in late 2010. Aren’t volunteers wonderful? She was very nice and transferred ownership of the memorial to me so I can now update it and add it to my list. When we were last visiting my in-laws up in central Wisconsin, we decided to take a trip a few miles east to the Plover, Wisconsin area. It turns out that a few of my wife’s ancestors settled in that area and were supposed to be buried nearby. 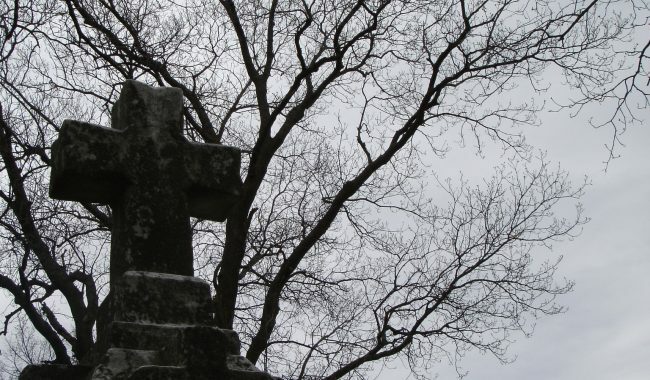 We took a drive out there one morning and happened to find a cemetery in Whiting, Wisconsin where our info said they were buried. It turned out to be the correct one, fortunately. We were looking specifically for Nathaniel & Rosina (ARNOLD) SHANNON, my wife’s maternal great-great-grandparents. There were a lot of SHANNONs in the cemetery and we did find Rosina’s headstone. Unfortunately, due to the position of the sun, it is very hard to make anything out on the stone. 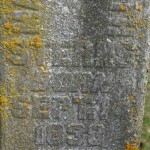 I’m pretty sure it says, “Rosina – wife of N Shannon – Dec 18 1824 – Dec 20 1899.” There was an Nathaniel SHANNON buried next to her, but since it was a Civil War stone I don’t think it was her husband since he would’ve been in his 50s when that war was fought. More than likely that is their son, Nathaniel. We didn’t find her husband’s burial spot, but we may have missed it on the side of her’s or another’s.